So here it is, the culmination of this walk, the highest point in Africa and the highest free-standing mountain in the world, Uhuru Peak, the summit of Kilimanjaro (5,895m or 19,341 feet above sea level). You were getting a photo of it for today even if it had been as flat and featureless as a bowling green, but in all honesty this was the most beautiful, spectacular summit of any mountain I have ever visited. Believe me though, the effort it took to get here was intense. I don’t mean the five days of walking which had proceeded it which — if one can avoid altitude sickness (and I did) was not all that difficult — but the final climb up the ash slopes of Kibo, done between about 11.30pm and 6am, because during the hours of daylight it would be a) too hot and sunny and b) next-to-impossible anyway because one needs the ash to be semi-frozen in order to have a chance of ascending it. I had heard reports of people saying that one took about three steps up and then had to rest for about twenty seconds before having a chance of moving on, and dismissed them as exaggeration, but I can assure you they are not. That is really what it was like. But once up there… time it right and one is there at sunrise. The light gradually reveals a wondrous landscape of delights, all over three-and-a-half miles up in the air. Here, the summit itself is on the far right of the picture, just caught by the sun which has also (I love this) projected a shadow of the whole summit cone onto the far horizon, neatly laid over Mount Meru, Tanzania’s second-highest peak, which at 4,565m or nearly 15,000 feet is no dwarf but from here is quite overshadowed (literally) by Kili. 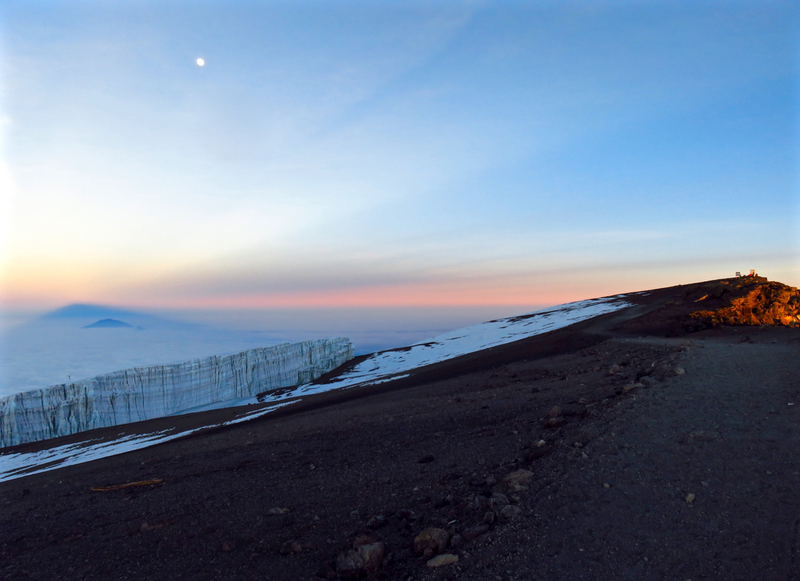 On the left is one of the mountain’s remaining glaciers, although don’t expect it to be around for much longer as within ten to fifteen years the ‘Snows of Kilimanjaro’ reported by Hemingway will most likely be gone — maps and pictures that show the whole summit area as covered in ice are now obsolete. Still, it’s a landform I’ve never been so close to before, and added an unearthly, or at least an un-African, element to the scene. The full moon above, which had illuminated our climb, is just the final touch. What a place. Will I be back? Who knows, perhaps. I probably would do it again. If you do get the chance, and fancy putting in the work, I highly recommend it.